Thank you Bloor West Village! For awarding us Best Service Provider in Bloor West Village, as per the Bloor West Villager Newspaper! You don't need to see a Doctor to see a Physiotherapist! Book an appointment directly by calling us at 416-766-8565. Welcome to Bloor West Physiotherapy ! 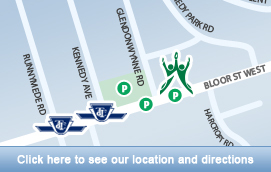 Bloor West Physiotherapy is located in the centre of Toronto's Bloor West Village, Bloor West Physiotherapy has been providing expert Physiotherapy to Toronto and Bloor West for over 45 years ! Bloor West Physiotherapy, Orthopaedics and Sports Medicine Centre is a highly renowned and trusted Physiotherapy and Orthopaedic rehabilitation clinic, having provided over 2.5 million treatments in all areas of Physiotherapy and musculoskeletal rehabilitation ! Our guiding Physiotherapy and rehabilitation philosophy is centered on 45 years of experience, with an evidence based approach to create an individualised multidisciplinary treatment program for each patient. We begin each Physiotherapy program with three important principles TREAT, PREVENT, EDUCATE. We empower each patient throughout the Physio treatment process to learn about their injury or surgery, recognize signs or symptoms of the injury which they might otherwise ignore, and provide them with the tools and effective strategies to avoid re-injury, or to change life style habits which may have contributed to the injury. Our multidisciplinary approach at Bloor West Physiotherapy includes, Physiotherapy (PT), Active Release Therapy - ART, Registered Massage Therapy (RMT), Chiropractic, Acupuncture, Custom Orthopaedic Bracing, Shiatsu Massage, Kinesiology, and Athletic Therapy. Your long term recovery is our goal, we are here to help. For a list of all our service, click here. Anti-embolism Stockings Most insurance companies allow our clinic “Assignment of Benefits”, in which case the patient does not have to pay up front.